Dauphin is most famous for Canada’s National Ukrainian Festival, held every summer and, indeed, for the Ukrainian immigrants who did so much to shape the town and its surrounding area. The first building to catch the eye of any visitor driving into Dauphin from the south is, appropriately enough, the Ukrainian Catholic Church of the Resurrection. One of the churches designed by Father Philip Ruh, its multidomed silhouette, brilliant paintings and rich icons bring a breath of the exotic Byzantine empire to the Manitoba prairie. 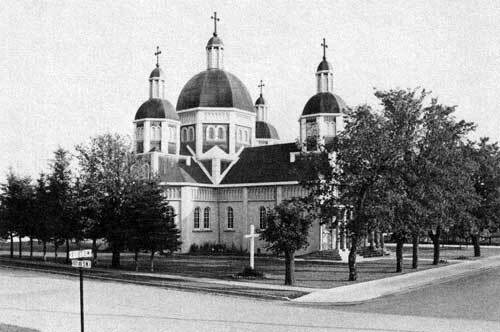 Ukrainian Catholic Church of the Resurrection, Dauphin. This is one of the buildings described in the latest architectural brochure published by the Department of Culture, Heritage and Recreation through the Historic Resources Branch, Dauphin: An Architectural Walking Tour. It was written by Neil Bingham. Dauphin, 310 kilometers north-west of Winnipeg, has a population of about 9,000. While the town is not famous for its architecture, a tour of its streets produces many delightful surprises. The Ruh Church is one, and St. George’s Greek Orthodox Church is another. This second building is modern, built in the late 1950s, but with its three large Eastern European domes it has the traditional beauty of Orthodox religious architecture. The interior is equally impressive, with the iconstas (icon screen) hand carved and painted by Kostas Papadikas of Minneapolis. Both churches are recommended stops on the tour. 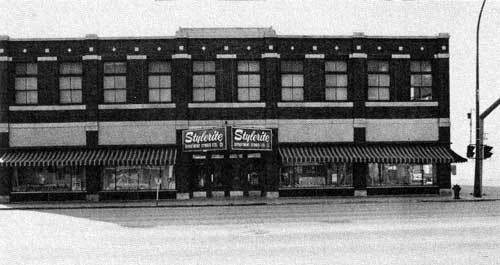 The Ramsey-Wright Building, known as the Stylerite Department Store. The tour begins with the CNR station. This handsome station built in 1912 replaced an earlier structure and it reflected Dauphin’s importance as a divisional point on the Canadian Northern Railway. Close by, Veal’s Royal Billiards and Royal Cafe on First Avenue NW is probably the town’s oldest structure, dating from the 1890s and giving the viewer the eerie feeling of having walked into a western movie. Another surprise is the old town hall, a 1905 brick building with a corner tower which has been lovingly preserved and is now the Dr. Vernon L. Watson Arts Centre. Interior of the former Dauphin Town Hall, now the Dr. Vernon L. Watson Arts Centre. The tour of the residential area is an excellent guide to Dauphin’s history. You can examine the house built for Dr. Bottomley, the town’s first doctor, and the original 1895 Anglican vicarage, once situated between the now-vanished villages of Gartmore and Old Dauphin. There are small, turn of the century working-class homes, as well as substantial brick and frame middle-class houses with towers and large verandahs built by lawyers and merchants who once formed the town’s business elite. 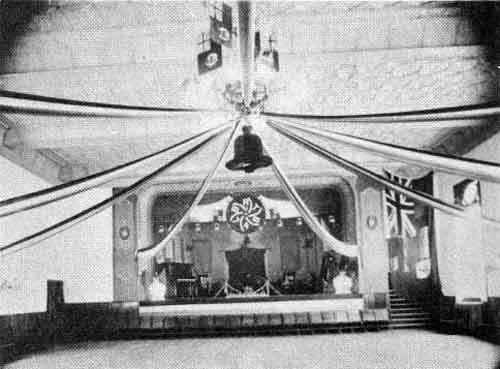 Among the public buildings described in the brochure are the impressive, white-columned Court House and the distinctive crest-roofed Royal Canadian Legion. The town’s oldest hotel, the Towers, began as the Canadian Northern in the 1890s but has undergone many changes. St. Paul’s Anglican Church, a lovely brick Gothic Revival building, has some fine stained glass. Back in the residential area, the former Ukrainian People’s Home on Eighth Avenue SW has a curved “boomtown” facade and holds memories of weddings, dances, plays, a library and a Ukrainian school. It is now used for storage. 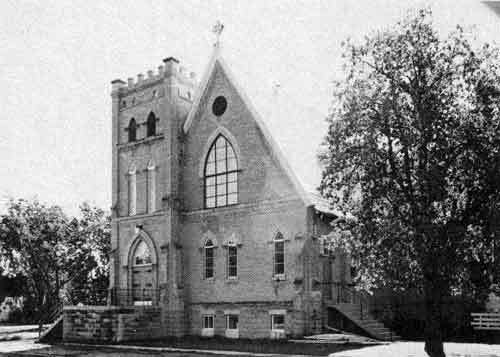 St. Paul’s Anglican Church and Rectory, Dauphin. The town’s museum on Jackson Street is a replica of a North West Company fort and includes pioneer buildings and exhibits. Near the entrance is a plaque dedicated to Peter Fidler, the Hudson’s Bay Company surveyor and cartographer, who spent many years in the Dauphin district. The Dauphin Walking Tour brochure is available from the Historical Resources Branch, 177 Lombard Avenue, Winnipeg, Manitoba, R3B OW5. It is beautifully illustrated and includes a map of the tour, an outline of the town’s history, and a glossary of architectural terms.